Reekado Banks is not happy with DJ Xclusive for begging him to jump on a track and then deleting his verse without telling him. Mavin act, Reekado Banks is really angry with DJ Xclusive. He feels used, insulted and is not afraid to show his disappointment. It's not quite clear if this is a stunt but looking at the parties involved it might just be for real. 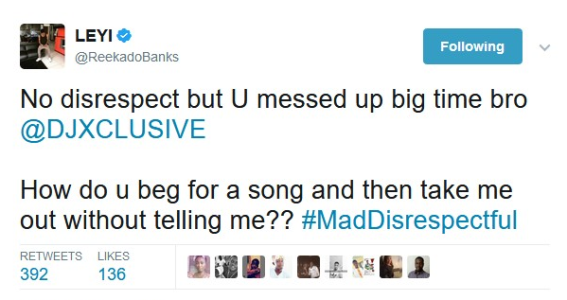 Reekado Banks in a series of tweets that have been deleted called out Dj Xclusive. He accused the popular Dj of begging him for a feature only for his verse to be taken out without his consent. At the moment, Dj Xclusive hasn't responded even though the tweets have been removed. The 96.9 Coolfm in-house DJ has made quite a number of hit tracks featuring several super stars including Timaya, 2Face Idibia, Davido and Wizkid.